Society: Unlike half-elves, where at least part of society’s discrimination is born out of jealousy or attraction, half-orcs get the worst of both worlds: physically weaker than their orc kin, they also tend to be feared or attacked outright by humans who don’t bother making the distinction between full orcs and half bloods. Even on the best of terms, half-orcs in civilized societies are not exactly accepted, and tend to be valued only for their physical abilities. On the other hand, orc leaders have been known to deliberately spawn half-orcs, as the half breeds make up for their lack of physical strength with increased cunning and aggression, making them natural leaders and strategic advisors. Within orc tribes, half-orcs find themselves constantly striving to prove their worth in battle and with feats of strength. Half-orcs raised within orc tribes are more likely to file their tusks and cover themselves in tribal tattoos. Tribal leaders quietly recognize that half-orcs are often more clever than their orc cousins and often apprentice them to the tribe’s shaman, where their cunning might eventually strengthen the tribe. Apprenticeship to a shaman is a brutal and often short-lived distinction, however, and those half-orcs who survive it either become influential in the tribe or are eventually driven to leave. Half-orcs have a much more mixed experience in human society, where many cultures view them as little more than monsters. They often are unable even to get normal work, and are pressed into service in the military or sold into slavery. In these cultures, half-orcs often lead furtive lives, hiding their nature whenever possible. The dark underworld of society is often the most welcoming place, and many half-orcs wind up serving as enforcers for thieves guilds or other types of organized crime. Less commonly, human cities may allow half-orcs a more normal existence, even enabling them to develop small communities of their own. These communities are usually centered around the arena districts, the military, or mercenary organizations where their brute strength is valued and their appearance is more likely to be overlooked. Even surrounded by their own kind, half-orc life isn’t easy. Bullying and physical confrontation comes easy to a people who have been raised with few other examples of behavior. It is, however, one of the best places for young half-orcs to grow up without prejudice, and these small enclaves are one of the few places where half-orc marriages and children are truly accepted and sometimes cherished. Relations: Elves and dwarves tend to be the least accepting of half-orcs, seeing in them too great a resemblance to their racial enemies, and other races aren’t much more understanding. 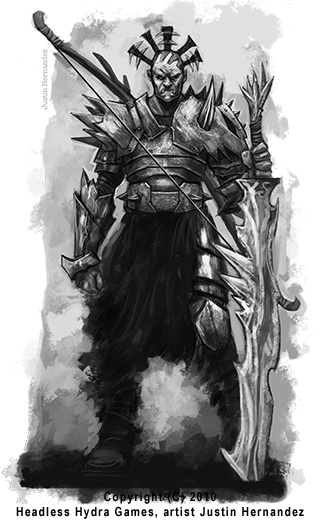 A lifetime of persecution leaves the average half-orc wary and quick to anger, yet people who break through his savage exterior might find a well-hidden core of empathy. Human societies with few orc problems tend to be the most accommodating, and half-orcs dwelling there can often find work as mercenaries and enforcers. Even in places where there is a general tolerance for half-orcs, however, many humans mistreat them when they can get away with it. Half-orcs are envious of the measure of acceptance half-elves have within human and elven society and resent their physical beauty, which contrasts starkly to the half-orcs’ brutish appearance. While half-orcs avoid antagonizing their half-breed cousins directly, they won’t hesitate to undermine them if the opportunity presents itself. Of all the other races, half-orcs are most sympathetic with halflings, who often have an equally rough lot in life. Half-orcs respect the halfling’s ability to blend in and disappear and admire their perpetually cheerful outlook on life in spite of hardships. Halflings fail to appreciate this fact because they usually are too busy avoiding the large, intimidating half-orcs. Alignment and Religion: Forced to live either among brutish orcs or as lonely outcasts in civilized lands, most half-orcs are bitter, violent, and reclusive. Evil comes easily to them, but they are not evil by nature—rather, most half-orcs are chaotic neutral, having been taught by long experience that there’s no point doing anything but that which directly benefits themselves. Half-orcs worship the human or orc gods venerated in the area where they were raised. Those who live alongside humans most often worship human gods of war, freedom, or destruction. Half-orcs raised in orc tribes find themselves most drawn to the gods of blood, fire, and iron—depending more on what god the tribe worships rather than the half-orcs’ personal preference. Many half-orcs are contrary about religion, either ignoring it entirely, or getting deeply involved in it and trying to find meaning in a life filled with hate and misunderstanding; even a half-orc divine spellcaster may wrestle with doubt and anger about religion and faith. Ability Score Modifiers: Half-orc characters gain a +2 bonus to one ability score of their choice at creation to represent their varied nature. Shaman’s Apprentice: Only the most stalwart survive the years of harsh treatment that an apprenticeship to an orc shaman entails. Half-orcs with this trait gain Endurance as a bonus feat. This racial trait replaces the intimidating trait. Toothy: Some half-orcs’ tusks are large and sharp, granting a bite attack. This is a primary natural attack that deals 1d4 points of piercing damage. This racial trait replaces orc ferocity. Mystic: Orc shamans are brutal teachers who sometimes kill or maim their most promising students in order to eliminate what could be a potential rival. Half-orcs who survive years of abuse by an orc shaman master are deeply scarred and altered by the experience. Shaman trainees learn early that cunning and luck are often the only things that offer a chance of survival. They have the shaman’s apprentice and sacred tattoo alternate racial traits. Brawler: Add 1/4 to the brawler’s effective level to determine her unarmed strike damage. Cavalier: Add +1 hit point to the cavalier’s mount companion. If the cavalier ever replaces his mount, the new mount gains these bonus hit points. Druid: Add +1/3 to the druid’s natural armor bonus when using wild shape. Hunter: Add 1 hit point to the hunter’s animal companion. If the hunter replaces his animal companion, the new animal companion gains these bonus hit points. Slayer: Gain a +1/3 bonus on critical hit confirmation rolls made while using sneak attack (maximum bonus of +5). This bonus doesn’t stack with those gained through Critical Focus and similar effects. Swashbuckler: Gain a +1/3 bonus on all critical hit confirmation rolls made while using the precise strike deed (maximum bonus of +5). This bonus doesn’t stack with those gained through Critical Focus and similar effects. Witch: Add +1 skill rank to the witch’s familiar. If the half-orc ever replaces her familiar, the new familiar gains these bonus skill ranks.